Last week I had a photo of Cotton tall and short in streaks in the field. 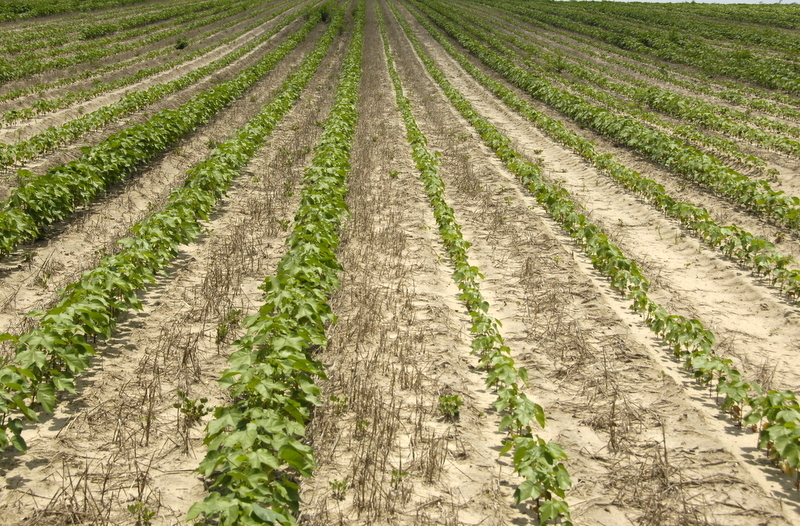 It was caused by a lack of fertility in those short cotton areas. There were peanuts in this field last year and the tall cotton is where the peanut hay was and so more nitrogen and organic matter was present. Also no preplant N was applied. So that increased the problem, here. 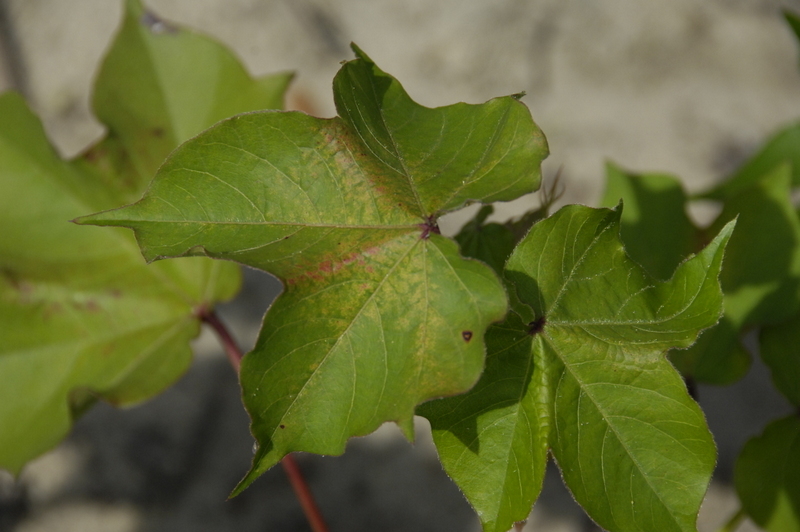 This week I want to know what is causing this leaf symptom in cotton? 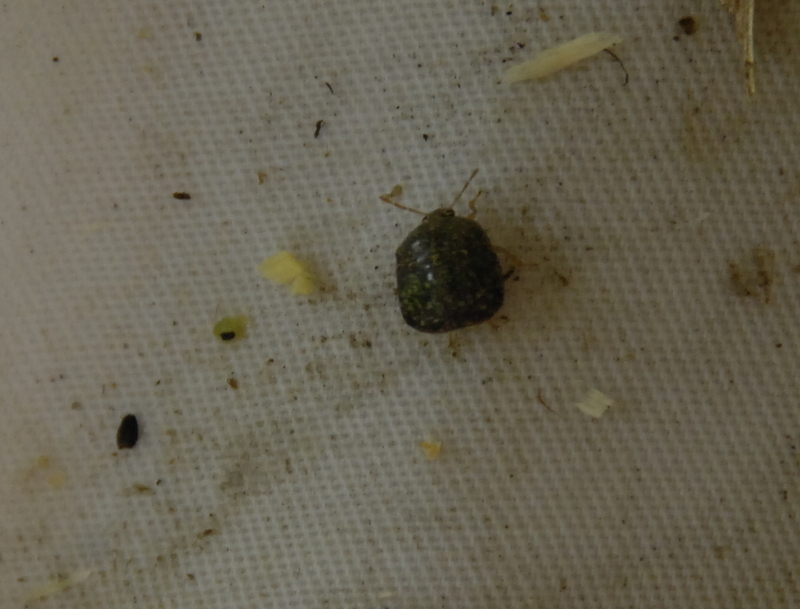 I found a kudzu bug crawling on my shirt in Seminole county this weekend after trimming Wisteria vines in my yard. We have them now across south Georgia. Here’s a link to a previous article I published about these pests with lots of information. 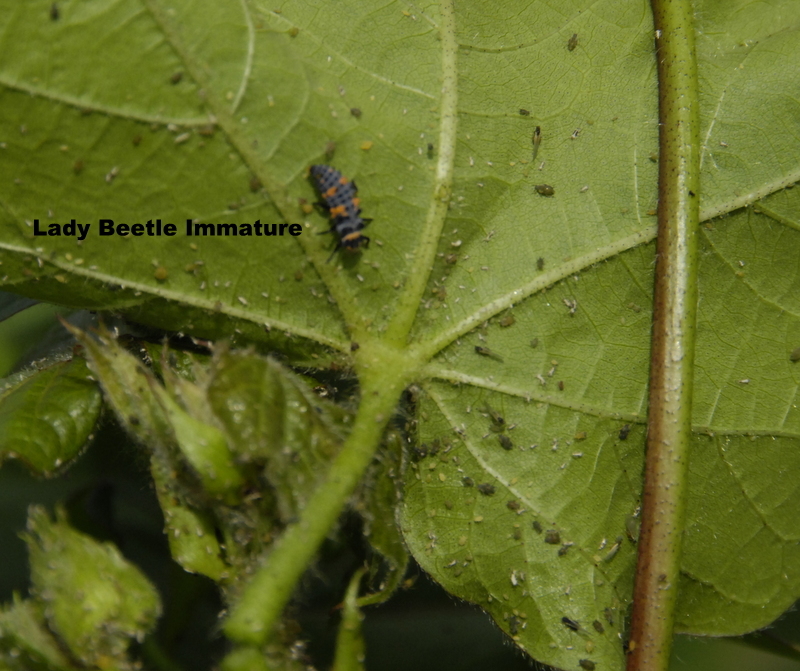 https://seminolecropnews.wordpress.com/2011/11/04/kudzu-bug/ They can cause us problems in soybeans so we need to be on the lookout. Ultra late planted irrigated soybeans (after July 20) do best in drilled rows of 7.5 inches at about 170,000 to 200,000 plants per acre ( minimum of 49 to 58 pounds @ 3500 seed per pound, if you get them all up, more for larger seeds and poor conditions). 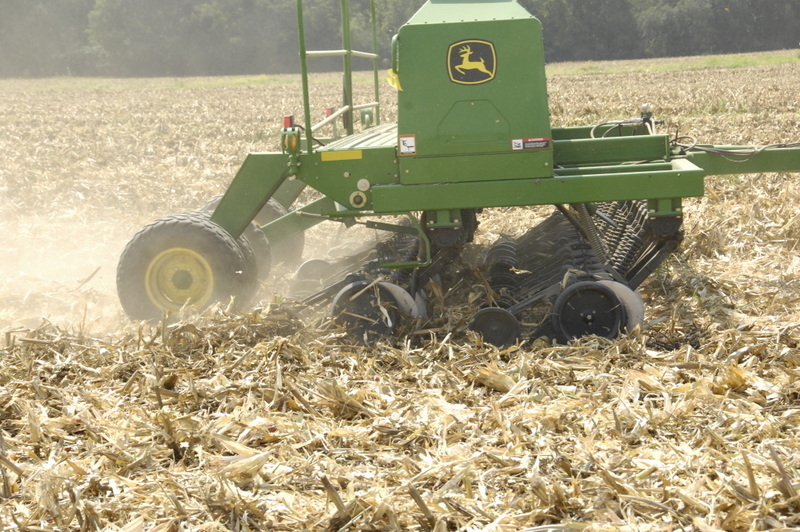 Successful farmers usually use a no-till grain drill just after corn harvest. If weeds are present , spray them just after corn harvest or just after planting. A preemergence residual herbicide may be used as well if needed. Farmer Raymond Thompson says to just leave the corn stalks as this will help at harvest time to get the bean plants into the combine and this saves a lot of work, expense and time, compared to disking and burning. I’ve seen them have the drill planting beans in the same field with the corn combine still there getting the corn out. Time is of the essence. Here’s a link to a planting video I took last year. Here’s a link to my slideshow concerning Ultra late soybeans. Just click on the photo. The quicker you get them growing the better. Planted in corn stubble growers have found that you will need to use 30-50 pounds of N to get these beans as tall as possible. The photo of the drill running is from last year. We often pump the nitrogen through the irrigation system. Always plant into wet dirt, plant and water to keep soil cool and moist. All season irrigation is necessary for good results. Certified Cobb variety soybeans is your best tried and true choice. It’s not Roundup Ready however so put your herbicides out quick as these beans will grow very fast. Other varieties have been used and may work well, especially before the end of July. Also watching for and treating for insects and diseases is critical. Seminole County farmers have often made 35 bu/acre and finished planting as late as the second week in August, but the later you get, the lower the yield and the riskier it is. In some years the yields are low when we have an early fall. Farmers say they like double cropping the soybeans behind corn for another reason, it keeps late season weeds down in the fields. Jimmy Clements of Plantation Seed, Raymond Thompson, Mims Farms, Jared Whittaker and Eric Prostko contributed to this article. Aphids have been real bad lately, sucking plant juices, slowing plant growth and leaving behind honeydew and sooty mold. Fortunately we have some help from nature in the form of parasites and predators. The lady beetle and its immature stage which is pictured here and looks quite different from the adult. Often folks ask how to control this bad looking pest that turns out to be a good guy. Commonly referred to as Lady Bugs these helpful critters are not bugs at all, they are beetles and their correct name is The Ladybird Beetle. There are about 400 different types of Lady Bugs in the Coccinellidae family inNorth America and about 4,000 species worldwide. The most common beneficial species inNorth America is the Convergent Lady Beetle. All Lady Bugs have similar life cycles. Eggs are laid in the spring. When hatched the larvae will feed for several weeks and pupate into adults. The adults feed through the fall, then either lay eggs and die, or hibernate over the winter, waking in the spring to feed and lay eggs. Lady Bugs are the most widely used and best known form of biological pest control. Famous for their control of aphids, Lady Bugs will also consume large numbers of whitefly, mealybugs, scales, mites and many other soft bodied insects as well as bollworm, broccoli worm, cabbage moth and tomato hornworm. A Lady Bug will consume up to 1,000 aphids in it’s lifetime in both its larval and adult stages. In the other photo I have a parasite, a wasp that is laying tiny eggs inside aphids that will develop inside the aphids and in a little while you will see the brown blown up carcasses of killed aphids and often a circular hole where the adult wasp has emerged. This is a valuable aphid parasite, Lysiphlebus testaceipes. Dr John Ruberson, UGA Scientist says “When this parasite is abundant, it can cause rapid and dramatic reductions in aphid populations, and their activity is easily detected as healthy aphids are replaced by swollen and hardened aphid `mummies.’ Here’s some more information about the parasite from Cornell University. “The female wasp inserts an egg into the aphid and in about 2 days a tiny wasp grub hatches and feeds internally on the living aphid. The wasp grub completes feedings in about 6-8 days, resulting in the death of the aphid. Movement of the wasp grub inside the aphid expands the aphid, giving it a swollen appearance. The larva cuts a hole in the bottom of the aphid, attaches the aphid to a leaf with silk and a glue, and the dead greenbug changes color from green to a brown “mummy”. Then the wasp grub molts to the pupal stage, and after 4-5 days a wasp emerges by cutting a circular hole in the top of the mummy. Hopefully soon we will see some more help from nature to control this pest. A naturally occuring disease usually comes in abouth this time of year here to wipe out most of our aphids on cotton.. This fungal epizootic typically occurs in late June or early July depending upon location. Once numerous gray fuzzy aphid cadavers are observed in a field we would expect the aphid population to crash due to the fungus in about a week. 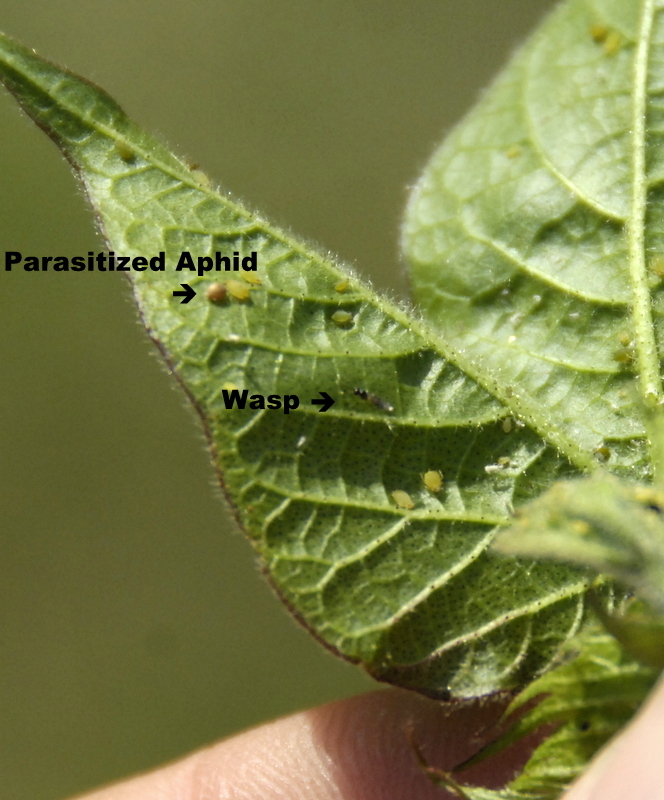 Aphids add stress to plants by feeding on and removing plant juices. Heavy accumulations of honeydew, yellowing terminals, and plant stunting should be considered prior to treating aphids. Grasshoppers are being found everywhere and especially in grass hayfields and pastures. Here’s Eddie Hill and Thomas County Agent, Andrew Sawyer as we were looking at grasshoppers in Eddie’s Tift 85 Hybrid bermuda hayfield. The grass was beautiful and there were lots of grasshoppers but we didn’t find a tremendous amount of feeding going on. We decided that the best thing to do here is cut the grass for hay and then reevaluate when grasss strarts growing back as to whether to treat for the grasshoppers. Hopefully they will have hopped over somewhere else by that time. 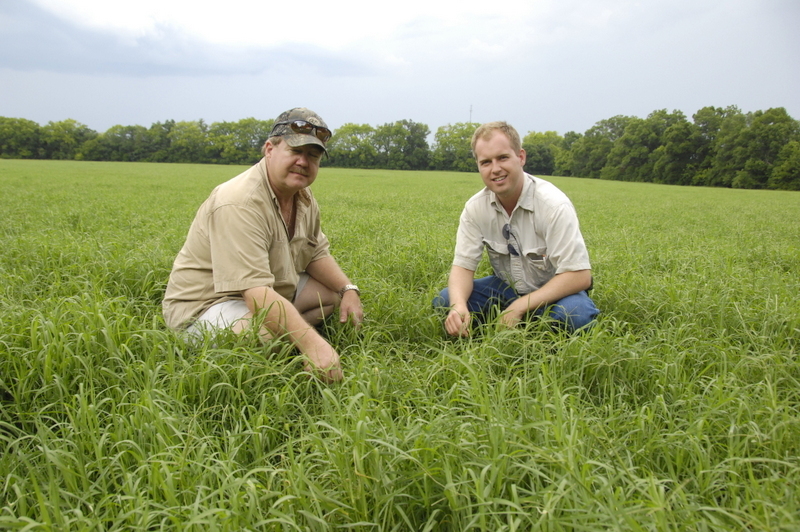 Georgia has played important roles in the history of forage bermudagrass in the U.S. and around the world. Common bermudagrass was reportedly introduced into the U.S. (probably from either India or Africa) in 1751 by Georgia’s second royal governor, Henry Ellis, in Savannah. Researchers and plant breeders from Georgia have also made significant advances that resulted in improved bermudagrass yields and forage quality. During his career, Dr. Glenn Burton, plant geneticist at the Georgia Coastal Plain Experiment Station (GCPES) in Tifton from 1936-1997, developed several hybrid bermudagrasses for southern forage programs. His most successful releases (e.g., “Coastal,” “Tifton 44,” and “Tifton 85″) continue to be recommended throughout the southeastern U.S. and in similar climates around the world. The warm season grass breeding program at the GCPES has continued this legacy of significant improvement in forage bermudagrass, with new and improved cultivars on the horizon. Several varieties of bermudagrass are grown in Georgia. Improved hybrid bermudagrasses that are recommended for Georgia will consistently provide higher yields and superior quality relative to other varieties . Hybrid bermudagrasses respond to high N levels (200 to 400 lbs. per acre) in a hay production program. These grasses produce well over four to six tons of hay per acre when moisture is not limiting. Under hay production, hybrid bermudagrasses can be cut four to five times per year. When used for grazing, these grasses provide high yields of good quality forage when the stocking rate is managed to keep the grass closely grazed (two to six inches) to maintain good forage quality. Cotton is growing well and squaring in most cases. 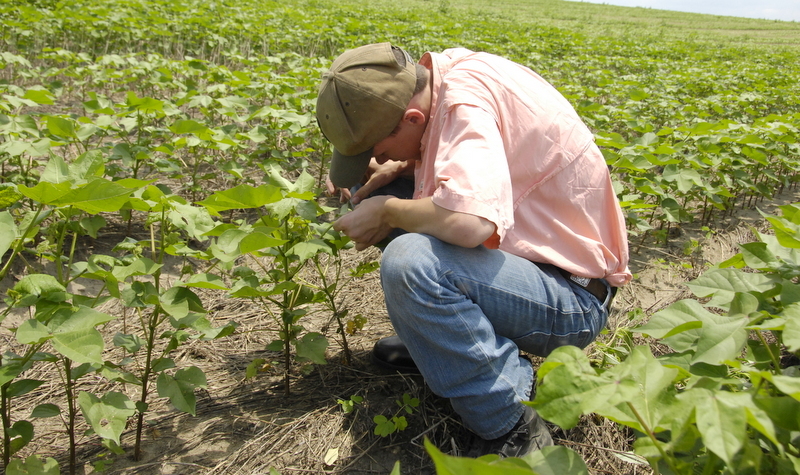 Here’s Alex Johnson looking at aphids. Aphids have been a concern in many fields. Hopefully they will soon get the fungus they get every year in July that gives us some natural control. Crop Consultant, Wes Briggs, says he has recommended treating chemically several fields due to the aphids stressing the cotton. Relatively new county agents from nearby counties, Andrew Sawyer, Thomas County and Max Demott , Mitchell County, were here recently looking at some crops with me. We found stink bugs, you can see the hatchout of young bugs and the adult brown stinkbug on the corn leaf. We noticed that corn is in the early dent stage in many fields. So it needs a couple more weeks or so until black layer formation when irrigation can be cut off. We need to keep it wet now, however as corn uses 3 tenths of an inch of water per day. When fully dented , it will decrease to 0.27 inch per day. But we need to keep water on it until black layer formation. You can start to see the milk line go down from the top of the kernel as we go from dent to black layer. This week I have a cotton growth question. Why do we see this streaking in this field, with some cotton tall and some short? 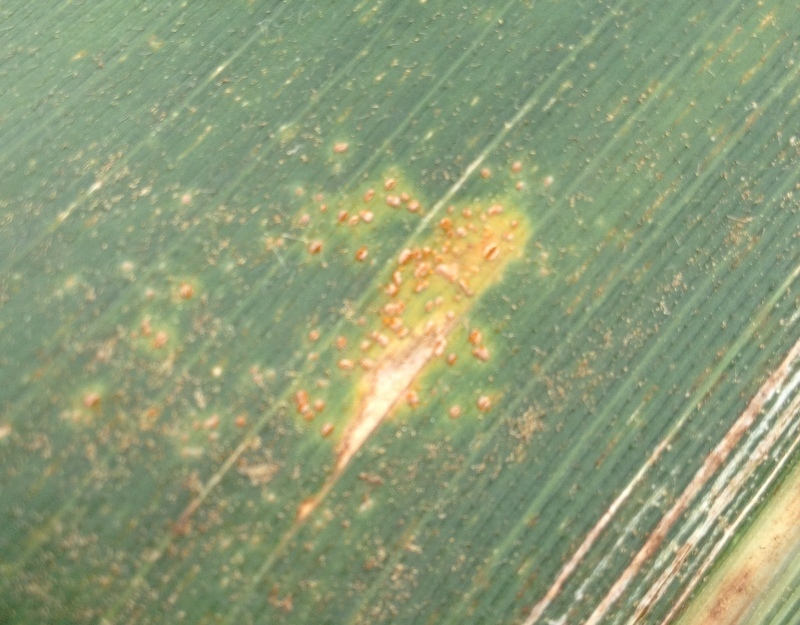 Southern Rust on corn has now been reported in Ben Hill, Terrell, Worth and Seminole Counties. Click on my photo to see a short news piece on Rust from WTVY Channel 4 out of Dothan. 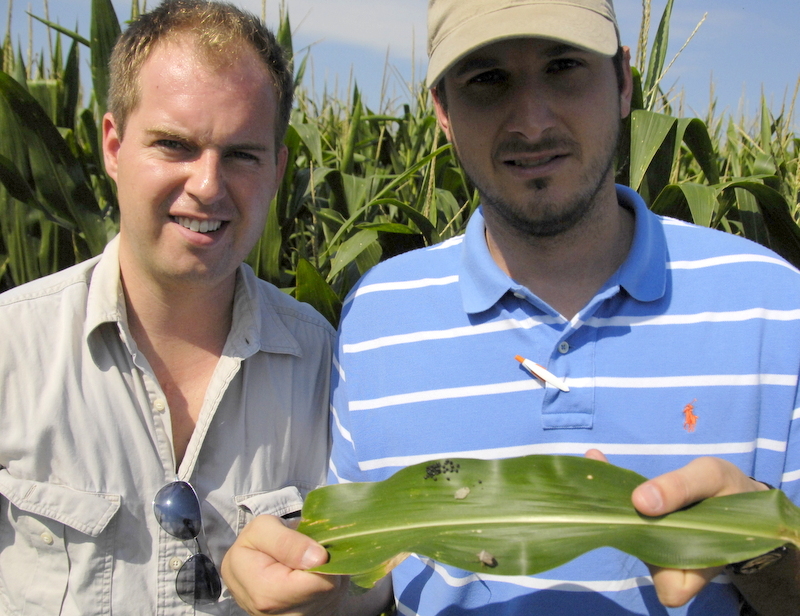 It’s likely that protective spraying of corn has slowed the severity of the problem across Georgia, according to Dr Kemerait, UGA Plant Pathologist. Stink Bugs are still bad this week in corn. Most of what we are seeing are brown stink bugs with a few greens and a rice stink bug here and there. We’re finding them in corn beside peanut fields like we do later on cotton by these fields. They don’t seem to hurt peanuts but they raise in them. If a field has been sprayed previously they sometimes start again moving in on the field edges. 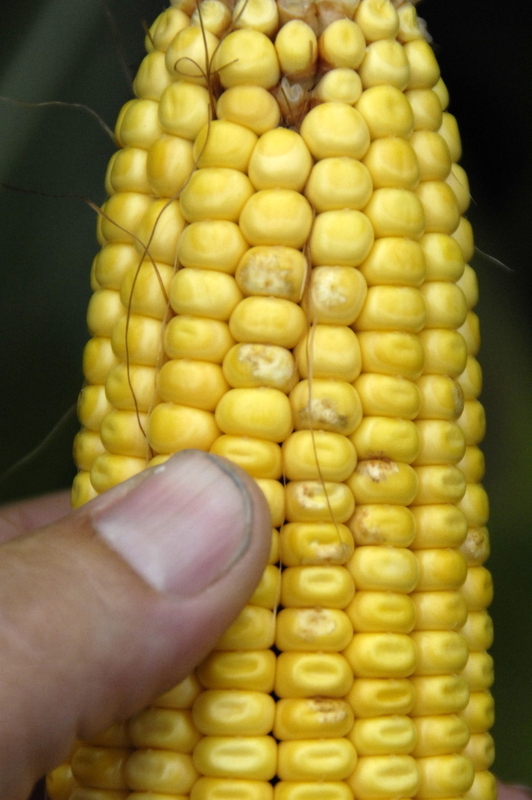 I found several in the field where I took this ear showing the individual kernel damage. 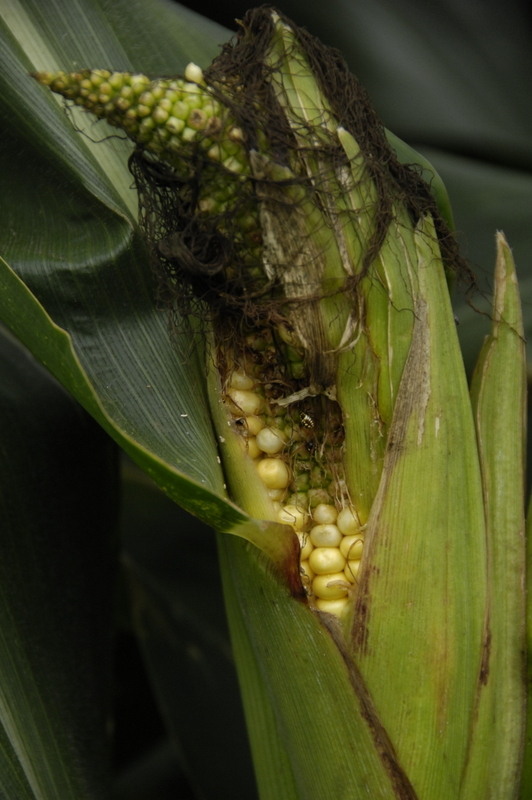 In the photo below you can see an ear of corn where stink bugs did earlier damage to it causing more damage to multiple kernels and twisting the ear.